More than 100,000 Israelis have attended a rally calling for an Israeli withdrawal from the Gaza Strip. 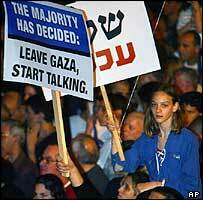 The rally in Tel Aviv was organised to show support for Israeli Prime Minister Ariel Sharon's pullout plan. The controversial plan has been rejected by the ruling Likud party but polls show most Israelis support it. Meanwhile, Palestinians won a small victory when an Israeli Court imposed a temporary ban on the demolition of houses in the Gaza Strip. The ruling was announced after Israeli troops pulled out of the Palestinian refugee camp of Rafah, having bulldozed dozens of homes. And early on Sunday morning, Israeli helicopters fired more missiles at targets in Gaza City. They hit buildings used by Yasser Arafat's Fatah movement and a newspaper that has supported the Hamas militant group. The blasts caused heavy damage to the buildings. There is no word on casualties. The Israeli demonstration, organised by the opposition Labour Party and a coalition of peace groups, began with a moment of silence for the 13 Israeli soldiers who were killed in Gaza this week. "I'm here because we can't take it anymore," said Tali Rosen, 34. "What got me out of the house was the deaths of the soldiers." The soldiers were killed in three separate ambushes by Palestinian militants in Gaza. Clashes also left about 30 Palestinians dead. Under Mr Sharon's proposals, Israelis would leave Gaza but keep parts of the West Bank. Labour leader Shimon Peres told the demonstrators that their numbers far outstripped the Likud members who rejected Mr Sharon's plan in a referendum earlier this month. "We will say good-bye to Gaza," Mr Peres told the crowd. The rally organisers claimed it was one of the largest protests of its kind since the demonstrations against Israel's invasion of Lebanon in the 1980s. In a meeting with Palestinian Prime Minister Ahmed Qurei in Jordan earlier on Saturday, US Secretary of State Colin Powell urged the Palestinians to "seize the opportunity" presented by Israel's proposed withdrawal from Gaza. After Israeli troops left Rafah on Saturday, the United Nations agency for Palestinian refugees (UNRWA) said the soldiers had destroyed 88 buildings there, home to more than 200 families. 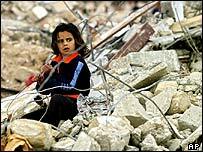 The Israeli military said it only destroyed homes used by Palestinian militants to launch attacks. The temporary ban on further demolitions was issued after an injunction was sought by a Palestinian rights group. Judges were due to discuss the issue later on Sunday. Earlier on Saturday, Israel also carried out a series of missile attacks in Gaza against Islamic Jihad, the militant group which claimed responsibility for two of the attacks on Israeli armoured vehicles this week.